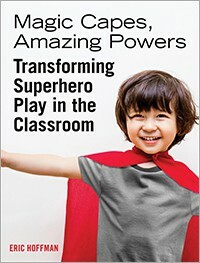 This book explores how the use of redirection, storytelling, dramatic play materials, anti-bias curriculum, and clear limit setting can guide superhero play in a positive direction. This unique resource addresses adult's concerns and allows children to do what they do best - play! For as long as there have been heroes and villains in our books, on our TVs, and in our everyday lives, children have been imitating them. Superhero play remains a wonderful, developmentally appropriate way for children to explore power, experience adventure, and investigate big questions about the world. At the same time, many adults are understandably troubled by the effect of media storylines, stereotypes, and violence on children's superhero play. Magic Capes, Amazing Powers takes an in-depth look at why children are so strongly attracted to superhero and weapons play, examines the concerns of parents and teachers, and suggests practical solutions that take into account the needs of children and adults.